Family-owned Vietti winery dates back to the 1800’s and was one of the first to export their wines to the US market. All of their wines are single-vineyard, declaring that vineyards possess their own personalities, in this case Tre Vigne. (My feelings on single vineyard wines). 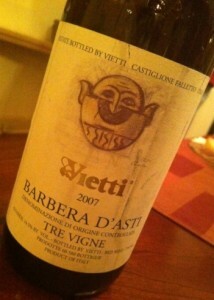 For more about Vietti, check out their website. Their incredibly inexpensive 2007 Barbera d’Asti Tre Vigne is loaded with concentrated red fruits of stewed strawberries and ripe cherries but also a few surprises like cola and plum. Medium-bodied, elegant and sports some tart acidity, especially on the finish. Some oak but refreshingly restrained — a hint of well-integrated vanilla to round out this pretty incredible wine.